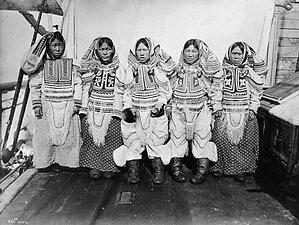 1) Referring to Inuit as "Inuit Peoples"
In the Inuktitut language the term Inuit translates to "the people". Knowing the translation helps us avoid a common mistake people make when working with the Inuit when they make statements such as "we are committed to working with the Inuit Peoples ". If you picked up on the words you would realize that the maker of such a statement is actually saying "we are committed to working with the peoples peoples ". To avoid this mistake, it would be correct to state that we are committed to working with the Inuit. "Inuit" is plural, and it also serves as the adjective; one person is an Inuk. participate more fully in Canada's political, social and economic development – for the benefit of all Canadians. It is not true though that they are treated the same as First Nations. For example, consider the fact that the Inuit are not covered under Canada's Indian Act, which is also a responsibility of Aboriginal Affairs and Northern Development. Further, many Indian Bands have changed their names to First Nation, in some instances to embrace and promote the connotation of being here first. In this sense the Inuit were here first but do not appreciate being labelled a First Nation because they are treated differently than the First Nations by the Aboriginal Affairs and Northern Development Ministry. If Inuit liked the term Eskimo they would have insisted it be included in Section 35 of the Constitution Act. Obviously they did not insist and opted for Inuit instead. As time marches on we see less and less use of the term Eskimo. The federal government has entered into several major land claim settlements with the Inuit. Inuit occupy the northern regions of Canada, living mainly in Nunavut, the Northwest Territories, Northern Quebec and Labrador as well as Ontario , which has a small Inuit population. Here is another related article you may find interesting. Looking for more information on Working Effectively with Indigenous Peoples®? Download our free ebook with 27 tips - just click the book cover to begin the download.